In RPG Maker, weapons can be equipped to actors. You can also equip them to enemies if you use plugins like Enemy Equips. Weapons can provide parameter bonuses like extra atk and agi, but you can’t specify a damage value for the weapons themselves. For example, if you wanted to have the normal attack skill’s damage value to be equal to the amount of damage dealt by the weapon, you would be unable to say this directly. You could say that the “atk” bonus from the weapon represents how much damage the weapon can do, but if you were to reference the actor’s atk, you would be including any additional atk bonuses that aren’t part of the weapon. 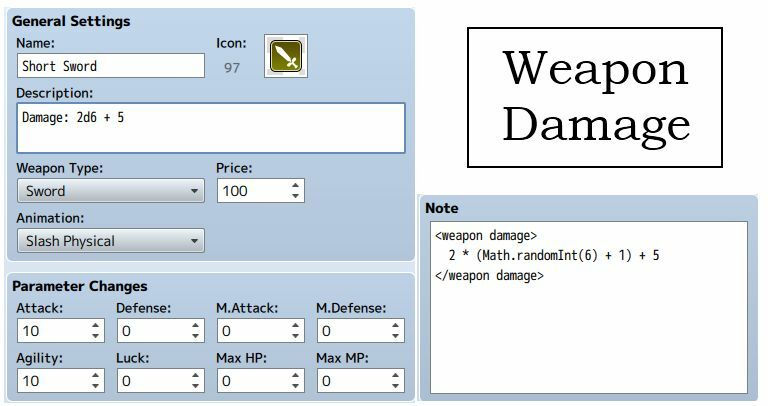 This plugin allows you to define weapon damage formulas, which can be used in your skill formulas if necessary. By separating the weapon damage from your atk, you have more control over how your want your skills to be set up! Download the plugin and place it in the “plugins” folder in your project’s “js” folder. Then open your Plugin Manager (F10), double-click an empty row, and select the HIME_WeaponDamage plugin. Once it is in your list of plugins, turn the plugin on. Note that we add 1 because randomInt picks a number between 0 and the value you provided. For those that are familiar, this is equivalent to 2d8. For now, weapon damages are assumed to be simple. Weapon damage formulas are not automatically included in your skill damage calculations, because you may not want to consider the weapon. For example, if you’re casting a spell and you’re holding a sword, would you include the sword damage in the spell damage? Maybe, maybe not. Which will return how much damage the attacker’s weapons dealt, based on the formula that you defined earlier. This value includes all weapons, so if the attacker is holding two weapons or three weapons or more, they will all be included in this total, which you can then use as part of the skill. So let’s say your normal attack was equal to your weapon’s damage. Which adds 1 point of damage per 10 points in atk. The weapon itself may provide atk bonus as well, but it is not necessary. Now, what happens when you don’t have a weapon? If no weapon is held, weapon damage is assumed to be “bare-hands” damage. Enemies by default are assumed to be bare-handed. Bare-hands is set up as a weapon in your database. You don’t need to actually hold this in order to use the damage formula, but you could if you wanted to. 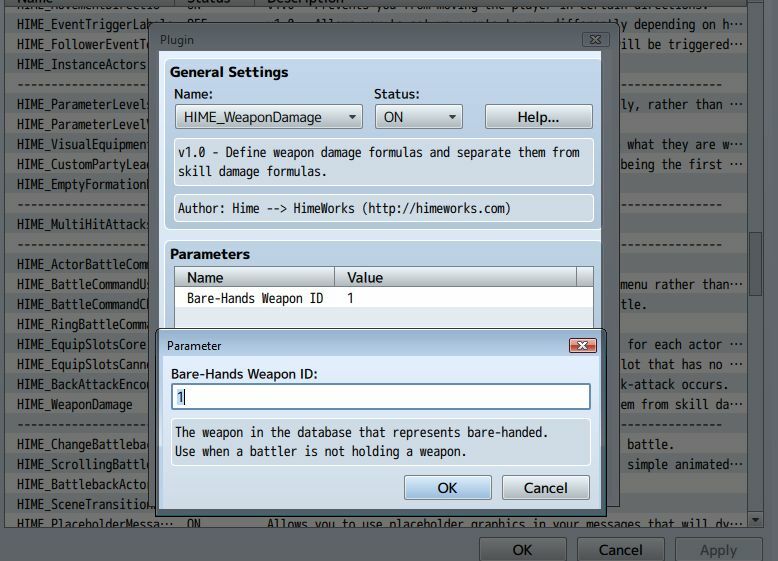 In the plugin manager, choose the ID of the weapon that will represent bare-hands, and then set up the weapon damage formulas usual. This damage formula will be used as the weapon damage. I found a compatibility issue with YEP Item Core. If Max Weapons is not set to 0, then the weapon damage in this plugin won’t work. However, it will work correctly during the Battle Test (because that part of Item Core doesn’t run during the test). Also, the Bare Hands damage will work normally regardless of the setting. no use weapon base ataque formula for damage help ? Two-handed Weapons’ Trait Seal Equip slot does not remove an already equipped “Off_Hand” weapon. This is a dual wielding issue. This breaks the game in that a two-handed weapon can be equipped in one hand with a one-handed weapon in the other at the same time. Is there a way to have an option in a weapon’s notes to remove an equip slot of an already equipped weapon (this case “Off_Hand”)? Or some way to get Two-Handed Weapons to remove an off-hand weapon to not break the game? This issue is so serious that I have stopped using R.P.G. Maker MV to pursue other game engines to make a similar game. I am basically more of a designer / artist / everything as Jack-of-all-trades minus a coder / scripter and this is a major bottle neck; everything in my game in R.P.G. Maker MV works fine minus this project breaking bug. Skeezix and Nol mentioned this earlier, but I wanted to ping it again because it gets to the heart of why I’ll have to figure out my own way to implement this kind of plugin: rolling multiple dice is not easily supported, and perhaps misunderstood. In the very top image for the plugin, at least as shown now, “2d6+5” in the Description box is supposed to equate to “2 * (Math.randomInt(6) + 1) + 5”, but that’s rolling a single d6 and doubling it, not rolling two dice independently. Later, the Usage example repeats the error, but while you could argue that 2*(1d8) does give the same range as 2d8, it’s not the same distribution of totals, i.e. how would you get a 15 total? “(Math.randomInt(8) + 1) + (Math.randomInt(8) + 1)” is really “is equivalent to 2d8”. Anyway, I’m planning on getting this plugin, then seeing if I can create my own overlay (or something, never done it before) to process strings like “2d6+5” and generate the independent die rolls needed. This is for a project converting a scenario from the Bard’s Tale Construction Set, which used weapon damage die rolls and a D&D-like combat system. The need is there, because there’s weapons that do up to “32d100”, and trying to manage 32 “Math.randomInt(100)+1” in a row manually is just ludicrous. Which doesn't look as nice, but at least it would be logically correct. but it does raise the question that Forteller (I think) asked: in testing, it looks like this is calculated only once on creation, not every time you use it! Which makes any random element in the formula, or dependence on a variable statistic, useless. This supersedes my 6/14/17 code, and calls a “multiDice(ndice,nsides)” function that I made into a plugin as you suggested. So now it generates new random values on each call that way, even with attacks that take multiple swings at the same target in the same round. In any event, it works now, and I’m able to extract the weapon notetag in a custom Status window. Let me know if you want my entire revised file. One of your examples is wrong. and simplified it as adding an extra point of damage per 10 ATK, but really that would add 10% damage per point in ATK, and only if that character had over 10 ATK. Good catch. It has been updated. Just a quick question, if you have 2 * (Math.randomInt(8) + 1) does this work like 1d8 + 1d8 or is it 1d8 * 2? Would i need to set it to something like below, or is there another way? it multiplies the 1d8 result by two. As everyone before, let me thank you for this plugin, which simplifiies my life a lot ! The formula works fine, …. Is the a.weaponDamage always using my actor’s ? have i missed something ? Check that the sword is not considered the “bare-hands” weapon in the plugin settings. First off, awesome plugin, ive been looking for something like this for a while now! Is it possible to do this? And so the weapon damage will be equal to the user’s attack, multiplied by 3. I deactivated a bunch of scripts, but more errors keep popping up every time i try again. It means that there’s an error in the formula itself. Can you post the formula? Instead of adding the actors atk on the weapon script, i added on the skill formula and I think everything is working, sorry for being stupid. That’s strange. If it works in the skill formula then it should work in the weapon formula as well. Its working on the skill formula, weapon formula always return 0. I’d like to add weapon damage using YEP Item Upgrade Slots. If I give my base item 5 slots and a flat 5 weapon damage, I’d like to be able to upgrade it 5 times to “Base Item”+5 and add 5 more weapon damage. You should consult the instructions for yanfly’s plugin to see how to check how many upgrades have been done, and then include that in the weapon damage formula. So this would separately add the proficiency bonus to the normal attack skill, rather than on the weapon itself? Yes, everything that is written in the skill’s damage formula only applies to the skill. Hi Hime, is there a way to duplicate the effect of this script with your VX Ace scripts? There a number of reasons I want to build my project in VX Ace, but I need weapon specific damage like the script provides. I don’t think I have an Ace script that provides an easy way to check for weapon damage. Okay, thank you for your help in any case. Hi Hime, is there a way to give enemies weapon damage without using the equip slots core and enemy equips plugin? No. Enemies don’t have weapons by default so weapon damage wouldn’t do anything. Is it possible to make armor increase weapon damage as well? Is the bonus based on the weapon checking what you’re wearing? No, It would have been a flat increase to damage. In this scenario the weapon is a laser gun (dual-wield) and the armor being an energy core that increases the damage of energy damage. I’m fairly new to RM so I might not have fully understood what you just said though ._. This means that if armor 14 is equipped, the weapon will deal 100 damage. Otherwise, it will deal 10 damage. What this logic means is having that specific armor equipped will give the weapon a damage bonus. Is there a way to change the Damage Formula of a weapon mid-game, like an item with Damage+1 property on the equipped weapon ? That would depend on how the bonuses are implemented, and consequently, how you would check what bonuses you have. What are you using to add the Damage+1 property? First, I thought to use an item with YEP’s Attachable Augments, but i don’t think this would work, so is this possible to use an Item on a character and his equipped weapon have +1 in its weapon damage ? A bit like the Monogrinder in Phantasy Star Online on Gamecube. Do you mean that each character will have a “weapon bonus” property, and then all weapons that are equipped will have that bonus? So if you gave the character an item that gives +2 bonus, and then another item that gives +3 bonus, that character will effectively have +5 bonus to all weapons? I tried attacking using the skill with the weapon equipped, but the damage was 0. The character has 26 atk total and the enemy has 30 defense. I tried this with just this plugin activated and I still get 0 damage. Open the console (F8) and then execute the skill. See if there’s any messages. I’ve updated the plugin. Previously, weapon damage formulas didn’t support the b variable. And then in your weapon damage formula, b will represent the target specified above. 1.3 is the latest version. You may need to clear your cache. Oh, okay. I have 1.3 and the formula is working now. Thanks. To specify, I can confirm that the weapon that’s supposed to be substituted in is working. If I manually equip the intended barehanded weapon to characters, then the values work out correctly, and damage is dealt. However, this weapon is not substituted in correctly, for either enemies or players. I have updated the plugin. It should work now. Thanks for the report. First of all, great script but im having a small problem. Somehow my characters always end up doing 0 damage, am I doing something wrong? Yes, brackets and everything is included. The only scripts im using are Yanflys Battle System and equip core. thanks! seemed to do the trick, I guess division ( / ) doesnt work properly. Hmm, that’s a bit strange that division isn’t working here. a.weaponDamage() return 0 for me. I believe yanfly’s ItemCore had a feature where note-tags are deleted from all individual equips once they’re created. This means that the weapon damage note-tag does not exist on any of your equips. Yanfly has introduced a feature in a later update called “Midgame Note Parsing” that you can set in your plugin parameters. By default it is turned off, but try turning it on and see if it makes a difference. Just a quick question, though. Does this work with armor as well, or only with weapon? I have not implemented armor formulas yet. This is specifically for weapon damage. I tried to make it work with Yanfly`s plugins but I couldnt reproduce the weapon attack formula. Is it just not compatible or am I missing something? Did you include the weapon damage formula in your skill damage formula? This is fantastic. The only possible way I can think it could be improved off the top of my head would be if somehow pulled up a different line for normal attacks based on the weapon equipped. You know, how in Dragon Quest, it will say “Eight slashes with a Longsword!” or “Eight threw the Boomerang!” I’ve never understood why RPG Maker never supported that sort of thing without huge workarounds, when it likes Dragon Quest so much. That’s just me nitpicking though, this is great and a big improvement over the VX Ace version! Will the option to draw damage/formula’s from individual weapons and/or armors be an option in future releases? What do you mean by “individual weapons”? We had considered the possibility of specifying each weapon, so like first weapon’s damage plus second weapon’s damage, but then you’d have to actually check whether the second weapon exists, and there were some other complications involved like what if you were only striking with one weapon, how would the skill know which weapon was used, and so on. So I ended up just having each weapon calculate their damage and then sum it up for the damage formula, assuming when you perform an action, all weapons will be used (this is based on default battle system). There was the possibility of using “Attacking Weapon” as part of the damage formula, so the game determines which weapon is currently striking, but that didn’t work out since we didn’t have a way to test it since there weren’t any battle systems where you could choose which weapon to strike with. Understandable, thanks for the quick reply.